Obviously we much prefer harpin’ on Leinster & Ireland rugby in this little corner of t’internet, but when there’s none to be had we don’t mind looking elsewhere. Yet one thing we don’t want to do is present a writeup on something like Super Rugby as though we had perfect knowledge of the competition. To us fans who are more used to rugby on this side of the planet, Super Rugby is a meal generally consumed on Saturday mornings, often when nursing the effects of a beverage or two the night before. A breakfast roll for the eyes, as it were. And unless you have a particular favourite team among the 15, you often find yourself watching a match looking for links to your own favourites back home. Like last season here at HoR we “adopted” the Waratahs partly because of the attractive brand of rugby they were playing but having Michael Cheika as coach as well as Leinster-bound Kane Douglas in the squad certainly didn’t hurt. When this season kicked off, I was still interested to see how the Tahs were getting on, but over on South Island in New Zealand the Highlanders were catching the eye as well with their own style, which in turn led to their attack coach Tony Brown being linked to the vacant head coach position at Leinster. So in many ways this made for the perfect contest for us to cover. So I guess now would be a good time to start covering it!!! Michael Cheika leads a team to its first major title, then the following season, when he has other ventures on his mind, gets them only as far as the semifinals when they defend their crown. Sorry for the crude comparison between Leinster 2009-10 and the Waratahs 2014-15 but from where I’m sitting it’s a pretty easy one to make. Something has to account for a swing from a 44-16 win over last season’s Highlanders (who were no slouches then either; they also made the final series) to a 17-35 defeat this time around at the same venue? We need to ask ourselves if we can pin this result on Cheika and his squad as a failure, or was it something external? Best look at the three leading contenders for number one scapegoat and see where we come out. I have ranked them in ascending order as I see them. The Highlanders HAVE been good all season, and their direct style has not only been a joy to watch but it also earned them their first ever home match in a finals series. But for this match they completely ripped up that playbook and went a lot more “old school”, playing their role as both away side and underdogs to a T.
Of course my above claim may seem a bit odd given they produced a whopping five tries at the Sydney Football Stadium but with the exception of the last one, which was scored with the contest pretty much over, there was an element of good fortune each time. First we had Aaron Smith pouncing on an errant pass from the base of a scrum in his own 22 by Palu. Tries two and four were contentious from a referee’s standpoint and I will cover those in the next point and Naholo’s try, while impressive in that he kicked it through to touch down himself, needed a lucky bounce to keep it in the end zone. Overall the Highlanders game plan was not to go all out attack as they had done all season, rather it was to pin the reigning champs in their own 22 where possible and even go for drop goals rather than tries when they thought they had the chance (could that be considered heresy in NZ rugby circles?). But to be fair, while things weren’t exactly going perfectly on the Highlanders side of the equation, their approach did make sense and for the most part they made a decent stab of executing it. Still though, I would only rank their own contribution at number 3 as a contribution to the result. The Aussie press suggested that referee Craig Joubert had a shocker of an outing in this match and his biggest howler was his interpretation of Jacques Potgeiter’s challenge on Patrick Osbourne who looked like he was about to score. For the most part twittersphere seemed to agree. I don’t, at least not exactly. In case you didn’t see what happened, shortly after that Naholo try I mentioned above, the Highlanders won a penalty deep in the Tahs 22 and their outhalf Sapoaga faked a kick to touch and did a tap ‘n’ go instead. It caught the home side by surprise and culminated in Osbourne getting to the try line. The ref decided to let the TMO have a look at the grounding, but the replay showed that the Waratahs’ South African-born forward made a last-ditch attempt to stop the try with his arm. My contention is that if you commit to swinging your arm you have to accept responsibility for where it lands. For this reason, I actually agree with Joubert’s assertion that since the arm connects with Osbourne’s head, it is a foul. And since the connection with the head prevents a try being scored, the result should be a penalty try. And since the try would have been scored under the posts anyway, the foul is in yellow card territory as well. And it’s not as though the ref didn’t spell out his reasoning for everyone to hear either. It made perfect sense to me anyway, at least in this given situation. HOWEVER...in the context of the match, I felt his actions showed a measure of inconsistency. The Waratahs got the game’s opening try in the 10th minute courtesy of Rob Horne, who I felt was their best player on the night. But as he touched down he received a high shot of his own from Naholo. Even though the try was scored in this case I thought there was a case for at least looking at the challenge again, possibly with a view to a card. And it didn’t stop there...shortly before the Potgeiter call Naholo was at it again when a ball kicked forward into the 22 was cleaned up by outhalf Foley and I felt the winger caught him high a second time, and what’s more he knew it too, making that he was injured afterwards. 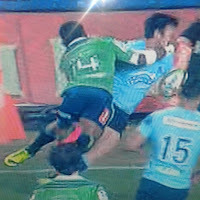 I have nothing against Naholo as a player and he has scored some fine tries for his side this season, but I do feel the Tahs were hard done by on the Potgeiter call given the other two challenges, much more visible on first look, weren’t even considered worthy for the TMO. And the inconsistency didn’t end there - Joubert ruled Tahs scrumhalf Nick Phipps as tackled when he got up and continued running in the first half...it didn’t seem too serious a call at the time as the home side were able to go back for an advantage. Yet the call seemed a lot more serious when the Highlanders centre Richard Buckman was deemed NOT tackled in what looked like a very similar situation and as a result he went on to get his side’s second try at the 32-minute mark. Those two controversial scores were the only ones the Highlanders converted on the night, so it’s hard to deny the result could have been different without those fourteen points. Or at least it is until you consider my choice of number one reason this match went the way it did. As far as I’m concerned, if you're going to harp on the referee’s decisions as if they somehow decided the result, you’d best be able to stand by your own side’s performance, and for this match Michael Cheika most certainly cannot. Now before I criticise...much like it wasn’t all perfection from the visitors, it wasn’t all bad from the Tahs. Despite the hefty final margin they were pretty good on general D especially in the early stages and after being pinned back in their own 22 for the opening few minutes, they did manage a decent try out of their first good possession. But while any team would miss a player of the calibre of Kurtley Beale, I felt very few of their woes in this match stemmed from something missing at inside centre. Right from the kickoff a halfback mixup saw a routine pass fired into thin air, then we had the Palu error leading to the Aaron Smith try, Foley was having a shocker kicking from the hand, and last and certainly not least, the Highlanders had their hosts’ number at the lineout, pinching four at key situations. Back in 2010 I felt Leinster’s season fizzled out after it was known Michael Cheika was moving on. It would probably be disingenuous to suggest a link between that and the coach having the mother of World Cup pools of death on his mind this time around, but while I freely admit I haven’t seen the Tahs’ 2015 campaign in its entirety, I have to say the thought did cross my mind as I was watching this display. Simply put...if you knew nothing at all about Super Rugby and were told one of these two sides were reigning champions, you’d have been hard pressed to tell which one it was. Maybe the margin was a bit harsh on the Tahs, but there is absolutely no doubt that the right team one as far as I’m concerned. So what now for the Highlanders...do they have enough to stand in the way of the Hurricanes in next weekend’s All-Kiwi final in the nation’s capital? The odds will be against them for sure, but they showed in Sydney they can adapt their style of play to match their surroundings.